Gwen is the main character and protagonist of the comic I, Zombie. The show iZombie will have a character by a different name but very similar to Gwen. She will be played by actress Rose McIver in the show iZombie. Gwen is a special kind of zombie called a revenant. A revenant is basically a fully reanimated corpse that maintains its own mind, and desires. She looks relatively normal and some might even call her "hot". 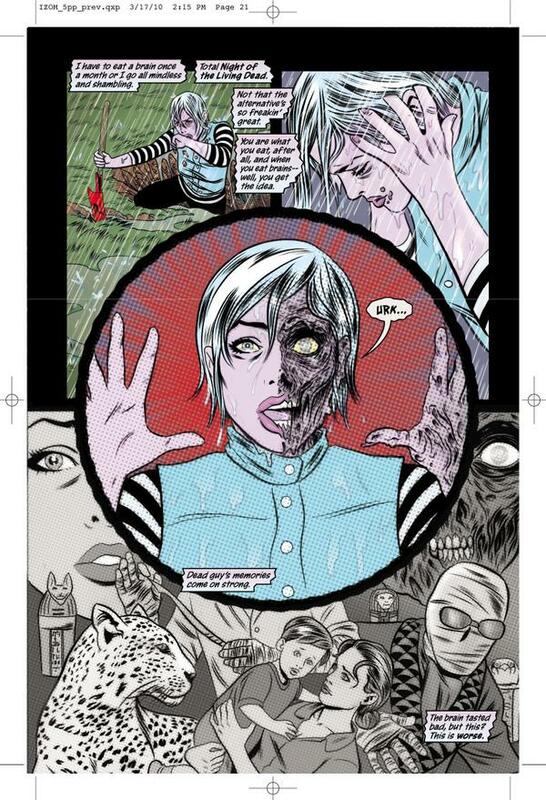 Some sites have already labeled Gwen as a ZILF a Zombie- ILF. Despite, looking normal there are drawbacks to being a zombie. In order to maintain her mind she must eat a brain once every 30 days. The eating of the brain prevents her from decomposing and turning into a full on mindless zombie. Gwen procures a job as a grave digger to gain access to a steady supply of fresh brains. She learns as a side effect of eating the brains she gains access to the dead person's memories. Gwen begins using this side effect to her advantage by enabling her to solve crimes where the dead were the primary witnesses to what happened. Gwen juggles solving crimes, young 20 something issues along with her special zombie issues. Gwen lives in Eugene, Oregon. The comic and TV show feature real places from Eugene. Gwen has a BSA from Oregon St university. After consuming someone's brain Gwen gains insights into their memories. This power is tied to a weakness of her being a zombie in that Gwen is forced to eat a brain once every thirty days or she will begin to decompose and lose her own memories and intelligence. Gwen begins to form a close knit group of supernatural friends that help her solve crimes.